It’s the season to be a copycat. First, it was reported that Facebook Messenger has set its sights on Snapchat’s streak feature. Now, Twitter is planning to jump in and steal a feature that is central to Pocket. Twitter has been testing a new feature called Bookmarks. Tina Koyama, a staff product designer, gave us a glimpse into the future. Through a few tweets, of course, with the hashtag #SaveForLater. Koyama basically showed off a bookmarks option, listed on the navigation page, that the users’ of Twitter have been used to. The feature had first been teased by the company back in October. Twitter’s head of product Keith Coleman had announced the upcoming change in a tweet. Bookmarks has been a top request of users during the past year or two and not a surprise that it has finally come to fruition. No date has been announced as to when the rollout will happen to the users. The earlier option to ‘bookmark’ a tweet was to hit the like button. That like though, was public. Liked tweets appear on one’s profile page and timeline and even notifies the person who posted that tweet. This bookmark feature is going to be completely private. Facebook should have just offered to buy out Snapchat completely and then subsume the features into its various products. That would have been easiest. Instead, it is just indulging in blatant copying that the whole world can see. Facebook has used its Instagram platform to use a Snapchat feature better than Snapchat. It copied the ever so popular ‘Snap stories’ feature and now ‘Insta stories’ have overtaken it with respect to the number of active users using the feature. The company was also shameless in lifting Snapchat’s face filters. 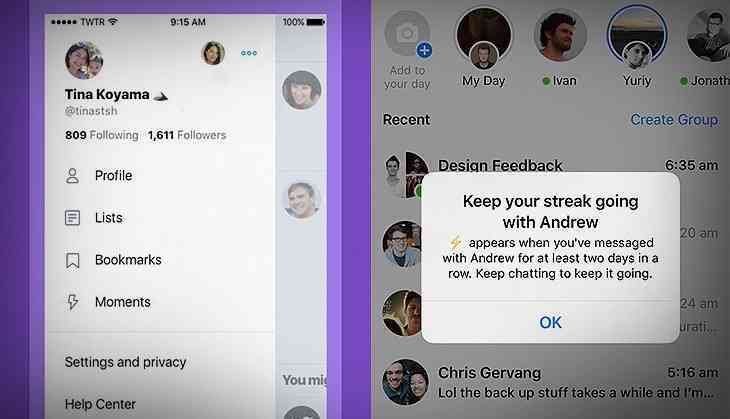 Now, Facebook wants to steal Snapchat’s streaks feature for its Facebook Messenger product. Just like Snapchat streaks, Facebook Messenger streaks will include an emoji status for anyone that you are currently on a streak with. It basically just tells you how many consecutive days you’ve been chatting with someone. Now it is just being tested on a limited number of users. It’s not clear at all as to how long this ‘testing’ phase will last and there is no word on whether it will roll out to the public. Whilst this feature is being tested with Facebook Messenger, don’t be surprised if it shows up in Instagram and WhatsApp – two Facebook products – as well.